You don't need to say it. We know having natural hair is hard and trying to merge mainstream style while protecting hair health is even harder. Watch out wash day! Curl Cap is your new best kept secret weapon. Opened in 2017, Curl Cap has been described as the natural girls accessory for life on-the-go and creator, Britney Crowell, spoke with me to answer burning questions about how her product is only beginning to reach its full potential. “I’m so grateful! This is the best feeling and it’s only been a couple of months.” Britney Crowell never knew she would be running her own business last year. The go-getter managed to maintain a full-time job and run a successful business at the same time. When asked what kept her going she said, “messages from supporters, and other women of color I've collaborated with”. What is the overall mission of Curl Cap? 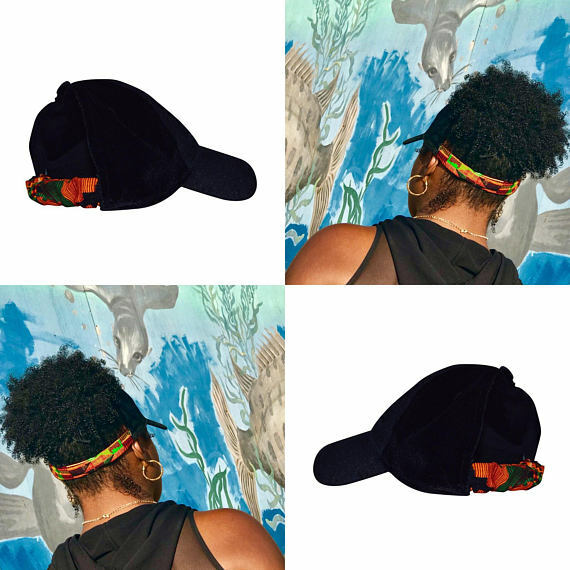 Curl Cap was created to empower, encourage and make women of color feel appreciated. The objective of Curl Cap is to find women and little girls of color who need a platform to highlight their specific beautiful curls. There’s a little girl I found on YouTube who was putting her heart and soul into a performance, it was so amazing. I was able to send her some hats and honestly, it’s those little things that make a world of difference. Sometimes just words of encouragements are all people need. Describe your brand in three words! Creator, Britney, wearing a pink velour Curl Cap. When it comes to being an entrepreneur, there’s so much that you could have done. Why Curl Cap? The history of Curl Cap is really simple. I’m a lazy natural hair girl, and for a while, I was cutting up my stockings and sewing them on to dad hats. I wanted to wear the hats but also wanted to wear my hair out. It was really just like “I want to be cute wearing dad hats”. Later, my boyfriend suggested that I see what I could with that idea. I ignored it because I didn’t know anything about starting a business but started reaching out to people about mass production and began selling to my friends. From there it turned into something that could be sold to others. 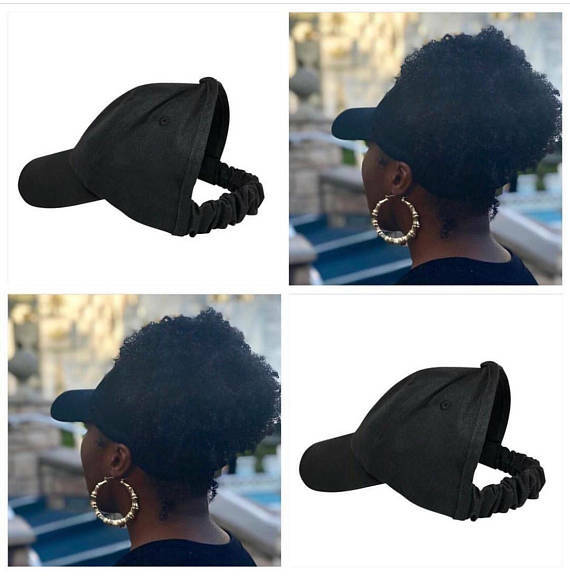 Do you get feedback from customers and considerate that when thinking of new designs for Curl Cap? Absolutely! My first run with the hats was a standard, basic black design. I started reading comments and found that people were requesting satin-lined versions of the Curl Cap. I take heed to everything that customers voice and I start researching to find out what would work best to get them what they want. You’ve mentioned not having any background in business, what type of research was involved in starting this company? Listening to podcasts was a huge help! There’s a podcast called Shopify Masters and host Felix Thea mentioned some info about using Facebook ads. He stressed the importance of finding customers who already have the product or already follow your social media platforms and valuing those individuals through interactions with them. Felix also spoke about reaching every unexpectedly beneficial audience such as the fitness industry etc. and diversifying the target audience so you're not constantly advertising to the same people. Not everyone follows a natural hair product so you want to tap multiple people on the shoulder and let them come to you naturally. Eventually I would like to create a kids line of Curl Cap! I want to take my time with that and make sure it is the best that it can be. Also, I package every single order myself so I want to make that a better experience for the consumer. I really want to better hone my branding and ensure that Curl Cap packaging, graphics, and everything else are of quality to make my customers proud! As I work with and encounter more creatives I plan to shed light on their talents in a project called Curlfriend Appreciation Day. The premise is for upcoming entrepreneurs or college graduates, etc. to share their back story and really put a spotlight on my customers who are doing their own thing like with my talented graphic designer, who is a young woman of color. It’s important for me to give back because it doesn't take much. Before Curl Caps I wasn't motivated and I didn't have a purpose, so having this opportunity means a lot! Now that you know more about this amazing young woman I hope you're encouraged by her journey to success. Grab your Curl Cap today before they sell out and be sure to leave Britney some praise for giving us a new way to rock our beautiful curls all day long!